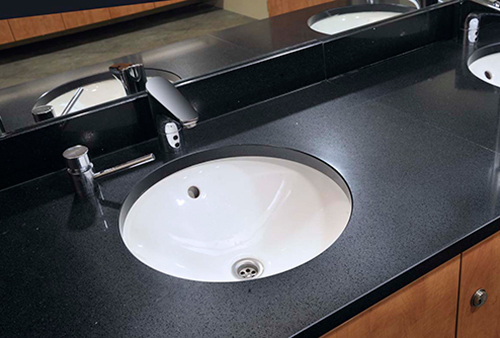 Granite or quartz vanity tops can add a touch of class and elegance to any bathroom. These surfaces are easy to clean and water resistant making them very practical. 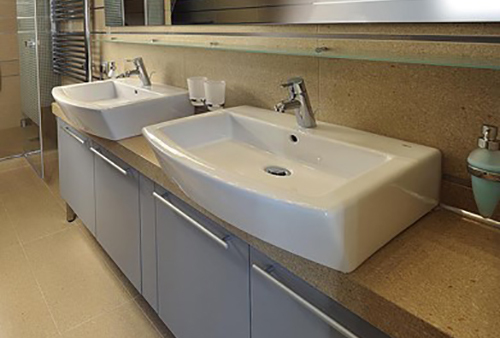 If you are matching to tiles or paint, bring a sample along with you, as well as the dimensions of the piece needed and we can give you a price on the day and reserve the stone that you choose. Bathroom vanity tops can be made on a supply only basis, or as a template and fit service, depending on your requirements. Prices start from £300 + VAT. 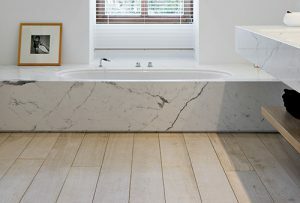 If you are looking to create a stylish and luxurious space in your bathroom then a granite or quartz bath surround or side panel can help you achieve this. These stones look great with almost any bathroom design whether both traditional or contemporary. Call our office today on 01565 300065 to check availability or arrange to visit to our workshop in Knutsford where you can browse through our off-cut selection. 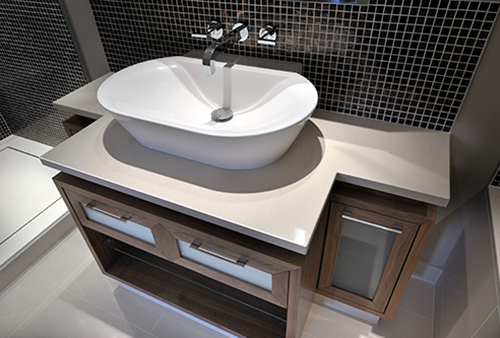 Quartz, granite and ceramic worktops are available across a wide choice of colours, styles and manufacturers. At CGW we always have the most up-to-date designs available at affordable prices. Need a hearth for a wood burning stove or electric fire, we can supply either quartz or granite in a variety of colours on a supply only basis. Do you need a hard-wearing surface for an outdoor kitchen or BBQ area? We can supply and fit granite surfaces for cooking areas, but also table tops for dining or bistro areas that can fit onto your existing furniture. Can't see what you’re looking for in the list on this page? We can make to order dining tables, console tables, coffee tables, side tables, drawer tops, and much more to your design specification. Whether you have granite or quartz worktops, there is no chopping board as superior for being scratch and heat resistant as quartz or granite. We supply chopping boards in several colours at £35 each. Find out what our customers think, with a selection of reviews from FreeIndex and Houzz. The quality and value of the work was excellent and the customer service brilliant. We had a problem with the build being ready for the scheduled date Donna was very helpful and went out of her way to accommodate us. Thoroughly recommend this company. I like to use local business so Cheshire Granite was just round the corner for me. From my first visit to the showroom and meeting Donna, to the final fix of my worktops, the service was excellent. The choice available was very good and the fitting first class. Excellent service, rapid turnaround and very helpful discussing options and costs. Cheshire Granite Worktops supplied and fitted a beautiful piece of quartz for our kitchen island, they were very professional, reasonable prices and had great customer service. The end result was a beautiful piece of quartz that is one of the highlights of our kitchen. Highly recommended. We had a granite worktop for our new kitchen. Donna was fantastic at helping us choose our surface; once chosen the templating and fitting were first class wouldn't hesitate to advise CGW for any work, excellent value for money and real made to feel that they value your custom. We had our Quartz work tops fitted by Cheshire Granite Worktops in April and we couldn't be more pleased with the results. The team were highly professional and had done the template and fitting within 2 days. Would recommend them. The whole process ran very smoothly, from selecting the worktop with Donna's help to final fitting. Each stage took place exactly on time and the work was carried out expertly with the minimum of fuss. Organisation, workmanship and product quality were all first class. We had Quartz worktops fitted to our existing kitchen. Great service from ordering right through to fitting and not ridiculously priced which when I saw the address of Knutsford I thought they might be, very wrong. The guys workmanship is outstanding, very pleased with the end result, completely refreshed our kitchen. 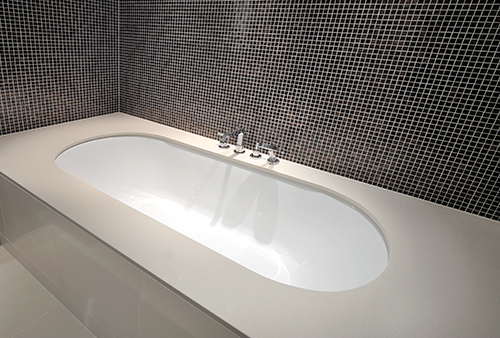 We would highly recommend Cheshire Granite. This is the second time we have purchased worktops. Donna was friendly and professional. Nothing was too much trouble. We also had a bar table top made to match. Following placing order came to measure up very quickly on the Monday and FITTED following day, Tuesday ! Check out our Instagram gallery, stuffed full of great images showcasing our work!